If the environment permits, almost every rubber fig will occupy a large piece of land with its exposed roots on the ground surface. It is always expanding its living spaces. Why it is so greedy and overbearing? In order to satisfy the breathing of its roots, to support its huge parts above the ground and to prevent other plants to engross its territory, rubber fig would make use of its developed roots to extend towards the ground surfaces, until its roots are exposed outside the earth; then, the roots would gradually close and form a network around the plant it parasitizes on. 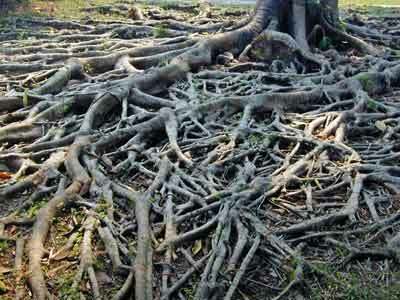 If we have a bird view on the root system of the rubber fig, we might be quite surprised. The network is thickly dotted and staggered, it varies in shapes and covers a round ground surface closely like a net. Rubber fig is a kind of arbor tree. Though it is overbearing and is always fighting off other plants, it is beneficial to human beings in some aspects. Its plant body can produce a sort of white milk, which is the raw material for rubber making in the early stage of industrialization, and the milk can also be made into soft rubbers. Rubber fig can grow as high as 30 meters; the canopy of the plant is widespread, its the barks are smooth, and it can be used as ornamental trees for yard forestation.